It’s a warm Thursday evening when Stina and I find a seat next to the stables. She is holding the lead rope of the horse she has just been riding, who enthusiastically puts his nose into the grass. 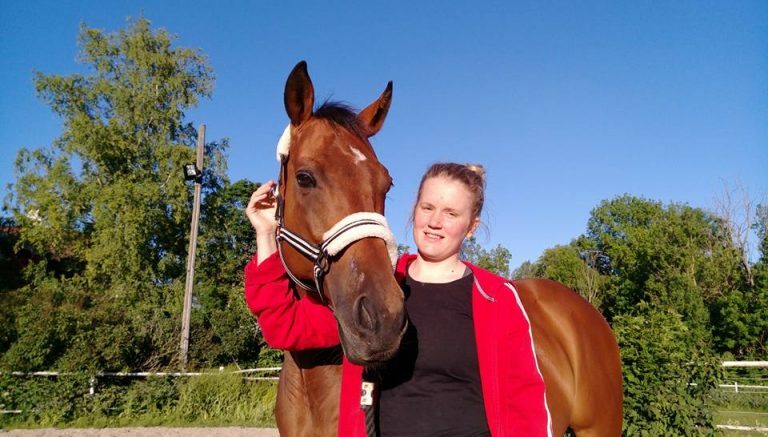 Not the most common circumstances for an interview, but in a way it suits the occasion: Stina recently started a PhD about vaccination against parasites in horses. Her blonde hair blows in the wind while she looks at the sweaty horse with satisfaction. I am happy she could squeeze in the interview today. There are few people I know who are as busy as she, yet she always seems full of energy. Stina started studying psychology in Trollhättan as well as biology in Gothenburg, but realised this was not what she wanted. 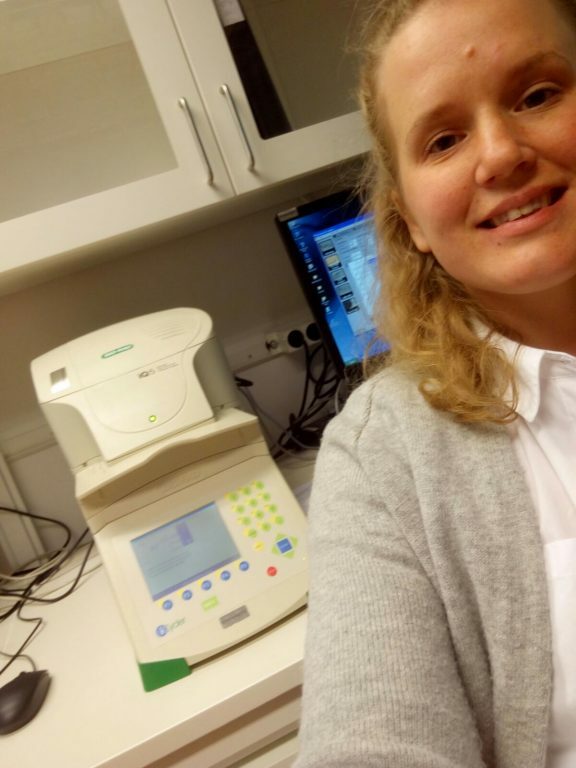 At the age of twenty-three she moved to Uppsala and followed the animal science agronomy programme at SLU and graduated with a master in infection biology. I ask her if a PhD was her ambition from the start? “No, I never plan anything really” she hesitates a little bit before she continues, “erhm, maybe that is not normal but I don’t have this goal of being something. I always chose things that I think was fun.” “Or interesting?”, I ask, finishing her sentence. “Or interesting, but many things are interesting!”, she adds enthusiastically. She explains that one of the reasons for her to choose SLU was that it deals with everything she thinks is important. “It doesn’t matter which programme you choose, you still get some perspective on food, how to supply our growing population with food and environmental questions.” In her opinion a really good strength to have such perspective, no matter what you end up working with. I’d like to know what the aim is for her four years project. She explains that she works on establishing methodology, how we can make this vaccine. “I know there will not be a finished vaccine after my studies, because this is a totally new project, this is the start.” However, this will not stop her from gathering as much information as possible to continue this towards developing the vaccine. Naturally I also want to know why we need the vaccine? “We have increasing problems with anthelmintic resistance today.” She tells me all about how the large bloodworm causes most damage to the horse and how the resistance in the small bloodworm could lead to increased prevalence of the large bloodworm in the future. Nowadays a common method is deworming with an oral paste, I am interested why we should change to a vaccine. “Most of the substances that are toxic to parasites are also toxic to insects and other organisms in nature. One problem is that when we give too much oral paste this will come out in the faeces, come out into nature.” She doesn’t expect the vaccine to be a ‘one fix solution’, but it could be used together with mucking and deworming. A selfie in the lab. Photo Stina Hellman. Finally I am wondering if she has any advice for people who are in doubt if they want to do a PhD position or not. She responds immediately, and says without any doubt: “If you’re interested in the subject, you should do it!” In her opinion, if you are worried about something you should simply talk to people: Ask other PhD students, your (potential) supervisor, etc. “Many people say ‘Oh, it must be really difficult!’, but I don’t think its more difficult than a normal job.” She emphasizes the need of being responsible and interested in the topic. “It is nothing that is impossible for a normal person. You don’t have to be a super person.” I guess she is right. However, I can’t help myself from thinking Stina may not realize herself how much of a super person she truly is. I’d like to thank Stina for her time and contribution. This interview was the third of a series I named ‘Inspired by’, in which I’d like to introduce you to other people and their perspectives. If you have any ideas, questions or comments please write them below. My friends wearing their self-braided flower bands. Photo by me. My first summer in Sweden meant automatically also my first celebrations of Midsummer. A Swedish friend of mine had invited a small group of friends to join her to her family’s cabin in the beautiful country side of Värmland. It was the perfect place to get to know this Swedish tradition, since midsummer is mainly an event from the country side. Packed with mosquito sprays, swimwear and lots of food and beverages we drove half a day to arrive at our destination. A beautiful red country house, located next to a lake between some fields and forests – how Swedish! 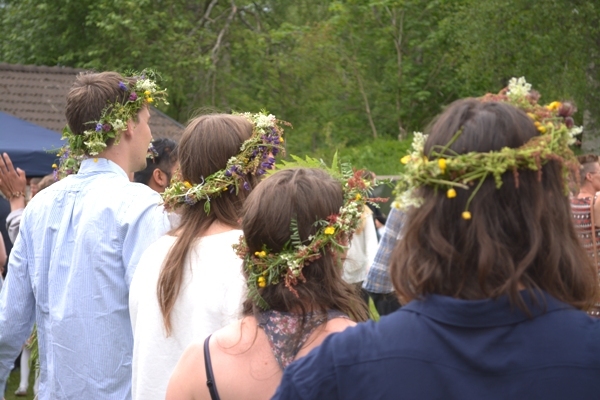 On the day of Midsummer (always a Friday evening between the 19th and 25th of June), we braided flowers bands and went to the centre of a nearby village to take part in the celebrations. It was very busy considering the size of the village and the atmosphere was vibrant and cosy. 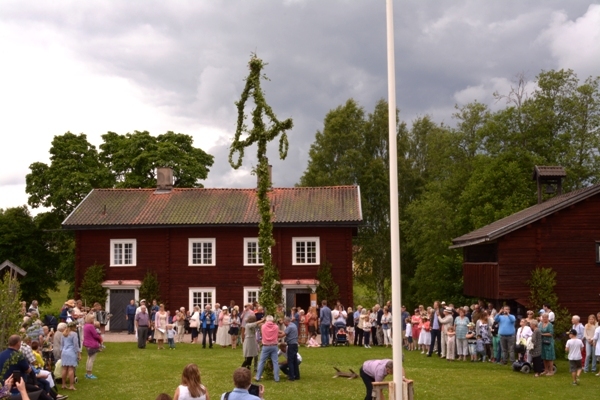 After the midsummer pole was put in place, the festivities began. A small group of musicians started to play and so the dancing could start. Midsummer is famous for it’s dances, and I think the most recognisable one is where you have to jump like a frog. Not kidding! Of course we international students wanted to try all of it and joined the families – mainly small children – in the circle. It was so much fun! The midsummer pole being put in place. Photo Hernán Capador. The Midsummer dinner seems to be as much of a tradition as the pole, flowers and dancing and was at least as wonderful. Between singing traditional songs and drinking schnaps we ate delicious Swedish potatoes and my friend had prepared a variety of fish and (vegetarian) meat balls. After dancing the night away it was time for the last tradition. In complete silence one must go out in the night and pick seven different flowers, carefully put them under your pillow and sleep on them. The person you dream about is the person you will marry! Have you experienced a Swedish Midsummer yet? Or want to know more? Feel free to tell me in a reply below. Last week we collected the last data for the preference tests. Meaning our project is slowly coming to an end. But before handing the chickens to their new private owners, we wanted to get some more information from them. During the project we’ve executed home pen observations, location & behavioural observations in the preference pens and the eggs produced were registered per pen. Now it was time to get a better picture of the status of the hens. 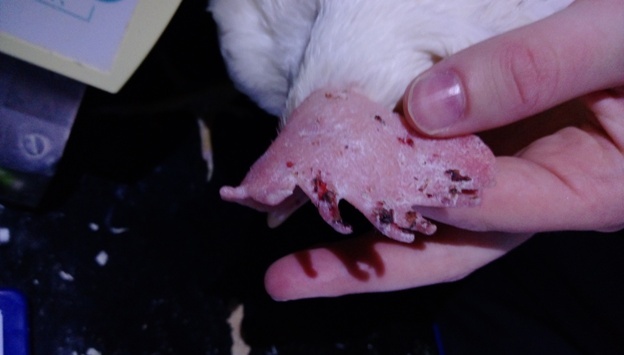 Therefore we’ve done some ‘integument scoring’: Rating the condition of the feathers. As an indicator for the amount of aggression in the pens, we scored the damage of feathers, combs and claws. Additionally we weighed all the hens, curious to further differences between the light treatments. It was quite an interesting experience to have a closer look at the birds. Most of them were very calm while we handled them, counting scratches and spreading their feathers. One or two birds seemed to disagree with our ideas and decided to peck at us! It seemed that there were very few birds completely intact, but there were very few birds with severe damage either. We were very happy to see that most birds appeared to be in great condition. It will be very interesting to see if there are differences between the light treatments. Coming weeks I will work on the data analysis, so we’ll know soon! Any questions? Please leave them in a reply below. Even though I’ve lived in Sweden now for almost two years, somehow I’ve always missed out on summer. My roommates were quite upset when I left last year early June, to come back end of August. “You survived all winter, but now you’re going to miss the best time of the year!”, Oskar would tell me with great concern. However, this year I am going to spend most of summer in Uppsala and I can tell you it’s been quite great so far. Honestly, today is the second time I even got sunburned. Not something to be proud of, I know… but I am just amazed by the strength of the sun! It seems like the sun is trying very hard to make up to us for her winter absence. Was she in winter only around for a few hours, now she just never wants to leave. Giving the night a nice glow, never allowing darkness to fall completely. 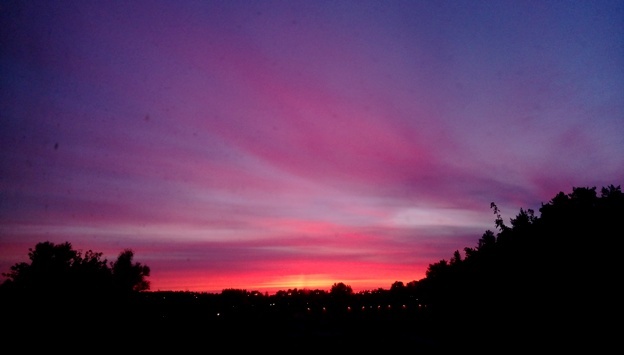 These long summer nights create such a warm and vibrant atmosphere. Uppsala has gotten more empty now most students have left for summer break, yet those still around are enjoying themselves with barbecues, gardening, drinking on terraces, playing outdoor games and cocktail party’s. The grass area between the student housings here in the Flogsta area, has the nickname of ‘Flogsta beach’: People are laying around in their swimwear reading books, while others are playing beach-volley nearby. After considering the study design, pilot studies and necessary preparations, we’ve been running our preference test for a couples of weeks now. This means that a few groups of our chickens are moved from their home pen to the test pen, where they will be observed closely for a couple of days. 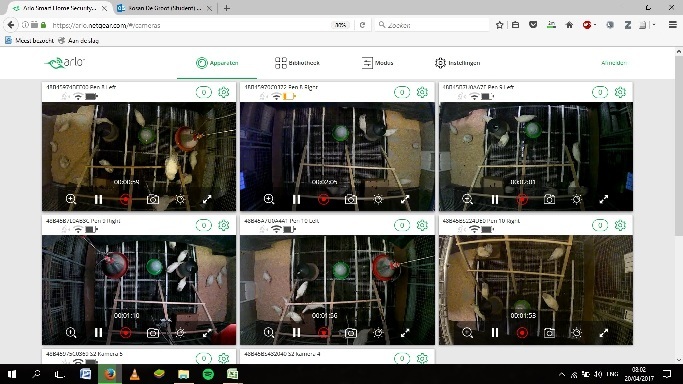 Observations run through a live camera system and are executed multiple times a day. The results are our so called ‘data’ and play the lead role for my degree project. Analysing these data will keep me busy for probably the rest of summer! The idea sounds not too difficult, but it took some time to get the hang of a smooth practical execution. 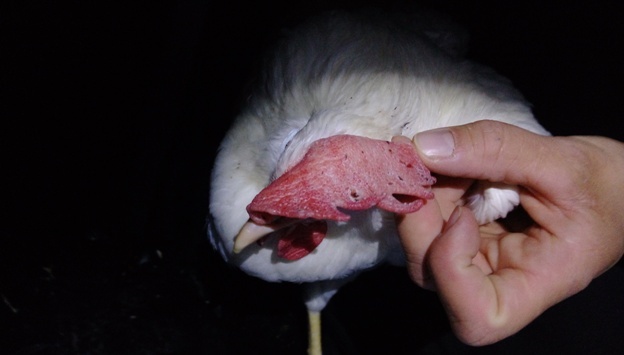 Because after each round of observations the chickens need to be moved back to their home pens, lights will need to be swapped and the pens cleaned before moving in the new groups. 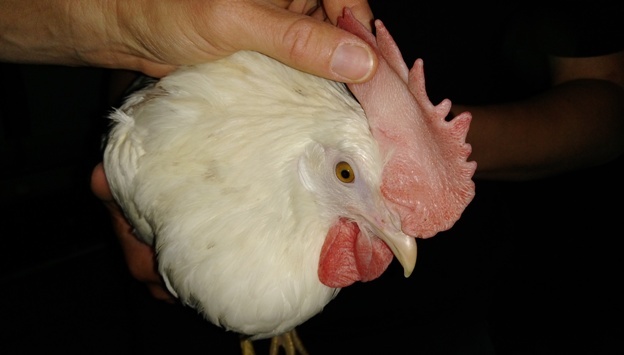 And also, how are you going to catch and handle the chickens, without causing them a lot of stress? Turning of the lights in the stables completely, turned out to be a magic spell to be able to catch and lift the chickens in a calm manner and move them into their moving boxes. Though it’s quite fun to do, it’s physically demanding, on one day you might have to catch and move almost a hundred chickens! Any questions? Feel free to ask them below. You might have noticed it’s been a bit quiet around here. I wish I could say I just had been so busy with my degree project, that there was absolutely no time left for writing the blog. Unfortunately, that’s not the case. About a month ago, while on my way home from Lövsta, I fell from my bike. Or to be more precise, I got lanced off my bike as some cable broke and blocked the wheel. I don’t want to go into much detail, but I ended up in hospital and had to spend weeks in my bed afterwards. It’s really upsetting this accident occurred, but on the other hand I am lucky it did not end far worse.